Pros: This is the second one of these, I fine it very comfortable to smoke with, you get a nice smooth draw. Pros: Adorable and not too small! Pros: Best little pipe, so easy to use and adorable. Cons: It is a little smaller than i would have liked, but decent size! Pros: Good with keeping the smoke in and the bowl is a nice size. Cons: Cleaning it. And the shape of the elephants body. Weird. Cons: None at all, shipped super fast, received the tracking # in an email really fast as well. Comments: I love the pipe, it's super adorable! However, the shape of the body throws me off! Really awkward lol but definitely worth the money! Pros: Very cute and works great. Just as pictured. I love how long the trunk is and how tall it is compared to other elephants. Cons: It is a little precariously shaped, so I try to make sure it's not in a situation where it would tip over and fall on the trunk. It hasn't tipped over yet. Pros: Super fast and looks even better in person! Pros: The pipe I received looked absolutely fantastic and my girlfriend absolutely adored it. It really looks great so good job to whoever or whatever made it. It's pretty dang cute. Pros: Sooo cute! Love it!Thank you! Pros: Hits really well, hard. Has a carb, which I was suprised about because from looking at the description, it didn't mention having a carb. im really happy about that :) shipping was so fast, came a day earlier than I expected! Cons: when I received it, it had some cosmetic damage, was missing a tusk "not in box" either but you can feel where it was so i'm going to make it a new one hope it looks good. Pros: good piece, very sturdy, nice color. Pros: The piece looks even better in person. The bowl is a perfect size. I have no complaints at all about this piece. Pros: Looks great, was a gift to a good friend and she loves it! Comments: Many Elephant pipes don't have tusks but this one did. Great! 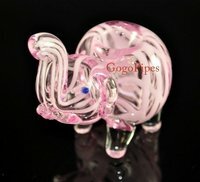 Pros: Whenever I need another pipe or need a gift for a friend I always use this site! I have ordered from them many times to add to my collection and I couldn't be happier! The prices are fantastic and I always receive my new item so fast! I recommend this site to anyone who is looking. Pros: It's amazing. One of the best purchases ever. Pros: This pipe is even better in person. The color is a very pretty and vibrant pink. The bowl is good sized and the weight is light. Pros: As always shipped very quickly. Hits very well, nice set up The girl loves it. Pretty thick for what it is. Cons: Face is kind of funny looking, looks as if eyes sagged when glass dried but its a good laugh. Probably different on each piece. Comments: Good deal for a decently made, unique, and practical pipe. Pros: Great piece! Looks awesome and hits great, it's a must buy. Pros: I bought 2. They both look very different but still pretty! Cons: The bowl of one of mine broke after almost a year of having it. Comments: Great price for having it and using it as much as i did. Would def buy again! Awesome piece. Pros: My friend has one similar & im looking to get one of my own. Hits nice & very cute! Pros: Thick deep bowl smooth hits. Love this cool Piece. Pros: Sooo cute. Hits so smooth. Thick glass. My new fav peice ! Pros: Super adorable, compact size, decent bowl, effective. Cons: May be difficult to clean. Comments: :) I'm very happy with this pipe, along with the fact that it was confidentially shipped to me within the same week I placed the order- I really can't complain. Pros: HAA!! !...I love this little pink Elephant glass pipe. It is a real talking piece - everybody laughs when they see it - and it hits well. Cons: A tad littler than I thought but the glass is very thick and sturdy. Pros: Fast shipping! Pulls great! Adorable! Perfect coloring! Decent sized bowl! Great quality for the price! Cons: None yet, other than maybe cleaning it. Haven't needed to clean him yet, but hoping he doesn't collect too much resin or blacken! Pros: this thing is so cute!!! it's a perfect size, my new favorite piece!!! it is adorable. price is pretty good. glass is thick, bowl is a pretty good size. Cons: none!! I love this pipe!! Comments: Hits really smooth, almost like a mini steamroller.